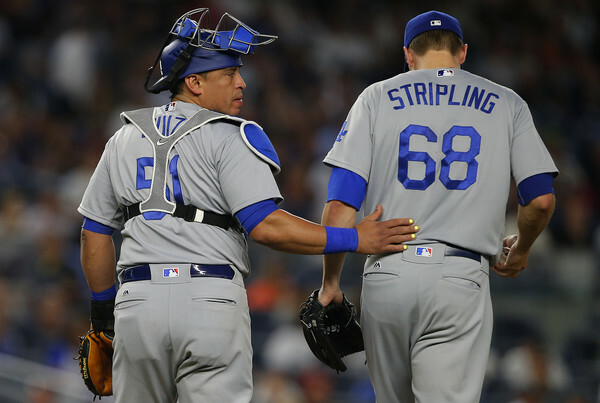 Ruiz reprised his role as Yasmani Grandal‘s backup in the playoffs. His pinch hit home run in Game 3 of the National League Division Series was one of three hits in 12 October plate appearances. Ruiz’s contract option will pay him $4.5 million next season. The trade allows the Dodgers to promote Austin Barnes, 26, to the role of primary backup next season. The Riverside native has a .180/.315/.230 slash line in 74 major league plate appearances, and a .869 and .824 OPS at Triple-A Oklahoma City the last two years, respectively. This entry was posted in JP on the Dodgers and tagged A.J. Ellis, Carlos Ruiz, Mariners, Seattle, Yasmani Grandal by J.P. Hoornstra. Bookmark the permalink.